Microbiology is the study of microorganisms, a large and diverse group of organisms that exist as single cells or cell clusters. The science of microbiology includes the study of microbial growth, biochemistry, genetics, and ecology, and the relationship of microorganisms to other organisms. Microbiology also includes the study of viruses and immune responses. As a basic biological science, microbiology provides some of the most accessible research tools for probing the nature of life processes. Our sophisticated understanding of the chemical and physical principles governing life has developed from studies of microorganisms. As an applied biological science, microbiology deals with many important practical problems in medicine, agriculture, bioremediation and food industries, and is at the heart of biotechnology and molecular biology. The Department of Microbiology offers an undergraduate program leading to the Bachelor of Science degree and a graduate program leading to the Master of Science and Ph.D. degrees. At the undergraduate level, courses in general microbiology, molecular biology, medical microbiology, immunology, prokaryotic diversity, bacterial and viral genetics, bacterial physiology and biochemistry, biotechnology, and virology are available to assist in your career and job-oriented goals. Our teaching laboratories will give you the chance to experience first-hand the procedures and techniques employed in modern microbiological research. Further, opportunities for undergraduate research abound. These opportunities to work with research-active faculty include course credit for research, as well as paid positions as an Undergraduate Assistant or student worker. We also offer several scholarships to help students pay for their education. 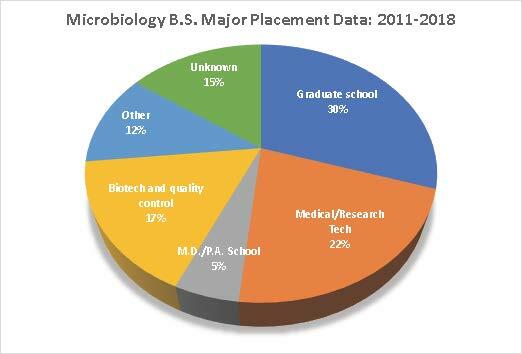 What can you do with a degree in Microbiology? Numerous jobs for students with a bachelor's degree in microbiology are available in the academic, industrial, pharmaceutical and government sectors. If your goal is to extend your education, our undergraduate program is excellent preparation for medical, dental, or other medically-related fields. You may also wish to pursue a Master's or Doctoral degree to further your career goals. We offer graduate assistantships as well as the opportunity to work with faculty engaged in research involving biodegradation, bacterial ecology and diversity, immunology, molecular mutagenesis, medical microbiology, and bacterial physiology. Graduate placement for our B.S. program is extremely high! In fact, 75% of our majors have been placed in STEM fields that include graduate school, medical/research, biotech/quality control, and medical or physician assistant school. 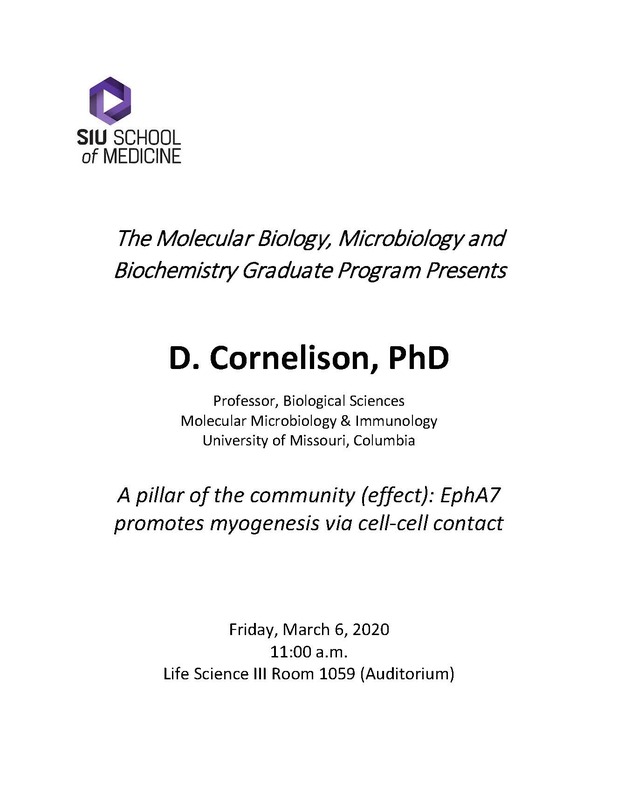 We hope that you will explore our web site to see for yourself the numerous opportunities that are waiting for you in the Department of Microbiology at Southern Illinois University Carbondale. Please contact us if you have any questions.